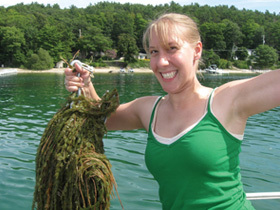 Macrophytes include rooted aquatic plants such as cladophora and algae such as chara, both of which are on the rise in Grand Traverse Bay. Huge mats of cladophora and algae die and wash up on shore, making a stinking mess. Scientists believe decaying cladophora on lake bottoms is linked to avian botulism, the culprit behind thousands of bird deaths in Great Lakes in recent years. The Watershed Center utilized aerial photography and our Bay Monitor tugboat to locate macrophyte beds in Grand Traverse Bay. At each location, we noted the size and composition of each bed. We also conducted a variety of water quality and sediment tests at various locations in the Bay to analyze for nutrients such as phosphorus. Some tests took place near macrophyte beds, while others will not. We also noted whether invasive zebra and quagga mussels were present at each macrophyte bed. Our study produces hard data to help scientists ascertain the link between macrophyte bed growth, phosphorus cycling and invasive mussels. This study complements our 1991 and 1998 macrophyte bed surveys. Those studies showed that the macrophyte beds had doubled in just seven years. The 2009 study was funded by the Michigan Department of Environmental Quality and the National Fish and Wildlife Foundation. 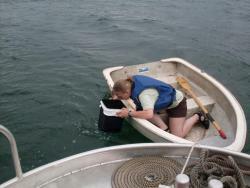 This work is important, as we all want healthy beaches and for lovely loons to be safe from avian botulism. About 400 beds were found, compared to 124 in the 1998 survey, and 64 in the 1992 survey. 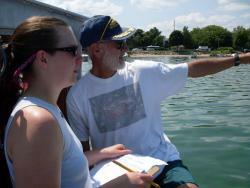 Embayment areas such as Suttons Bay, Omena Bay, Northport Bay, Bowers Harbor. The southern (bottom) part of West Bay. Shallow shoal areas around Lee and Stoney points. A lot of beds were found along the drop-off area, where the slope gets steeper and the water deepens–usually in 13 to 20 feet of water. Most beds were found in West Bay. East Bay has far fewer than West Bay, especially the east side of East Bay. This is most likely because the eastern shore is not as sheltered from wave action coming down Lake Michigan. Also, there is less development and are no embayments on the east side. 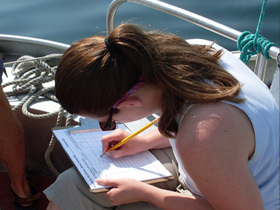 The vast majority of plant species encountered were Water Milfoil and Chara. Invasive mussels such as Zebra and Quagga mussels are such effective filter feeders that they strip the water of various plankton that indigenous creatures eat. This also filters the water so much that sunlight reaches greater depths, increasing aquatic plant growth. Some theories state that waste from mussels is loaded with nutrients and, once excreted, collect on the lake bottom, enriching sediment. This nutrient-rich sediment, combined with the clear water, may be a factor in the increasing number and size of macrophyte beds in Grand Traverse Bay. More aquatic plants in the Bay ultimately results in increased decaying plant matter. This decomposition can create an oxygen-deprived, or anoxic, environment. The botulism toxin is produced by the active bacteria Clostridium botulinum in the nutrient-rich, anoxic conditions in thick mats of decaying aquatic plants. The Round Goby, an invasive fish, ingests the botulism toxin. Waterfowl eat the infected gobies then die from botulism poisoning—hence the term avian botulism. In 2006 and 2007, thousands of waterfowl at Sleeping Bear Dunes National Lakeshore suffered from the effects of Type E botulism. In 2007, the Watershed Center received reports of at least 100 bird deaths in the Bay. Affected species include Ducks, Loons, Scoters, Terns, Bald Eagles, Piping Plovers and Seagulls. In 2008, the Watershed Center received only a handful of reports; this is likely due to botulism being cyclical. The growth of macrophyte beds, or Cladophora, along with the spread of invasive Zebra and Quagga mussels need further research to effectively track the spread of Botulism poisoning.